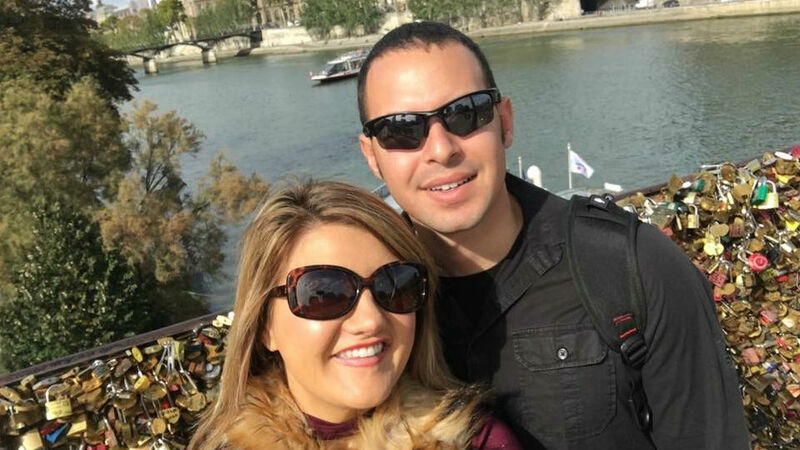 Only ten months were needed for Captain Josh Correa to ask Envoy Flight Attendant Ciara Dasher for her hand in marriage, cashing in on their serendipitous first glance where they truly fell in love. Looking at their photos and watching them with one another, even the most curmudgeon-y of curmudgeons would catch a feeling. 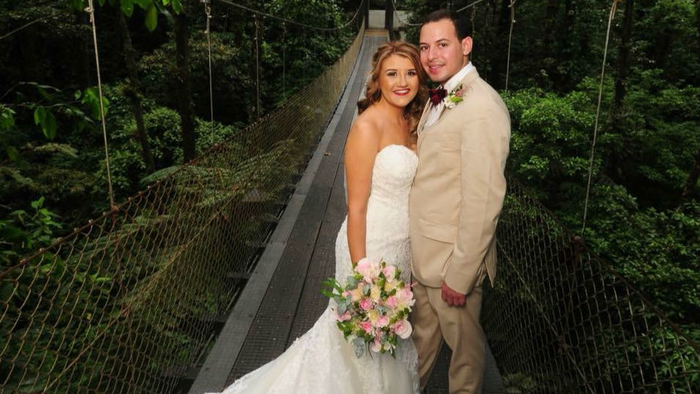 Below, Josh and Ciara tell us all about how they met, their elopement in beautiful Costa Rica and how finding someone who loves to travel is easy when you both work for an airline. You mentioned you met in the crew room, who made the first move? Josh: I flew with Ciara’s old roommate before she and I ever met in person, and I distinctly remember her roommate mentioning what an awesome person she was. One year later, I ran into Ciara in our Dallas crew room. The ironic part was that I very rarely flew through Dallas since I was Chicago based. I instantly recognized her from pictures I had seen on Facebook. We made a little small talk and then I went back to the pilots lounge without thinking much about it. A few weeks later she sent me a Facebook friend request. The rest has been a blur but has consisted of a ton of great laughs, trips around the world, and eventually led up to wanting to spend the rest of my life with her. How soon after meeting and how did you propose, Josh? Were you surprised, Ciara? Ciara: We were dating approximately 10 months before Josh proposed. I kind of knew it was coming, because we’d gone to look at rings. However, I didn’t know when it would happen exactly. What tipped me off was that Josh always puts his wallet in his front pocket and on the day he proposed, I noticed it was in his back pocket and something else was in his front; a small box. 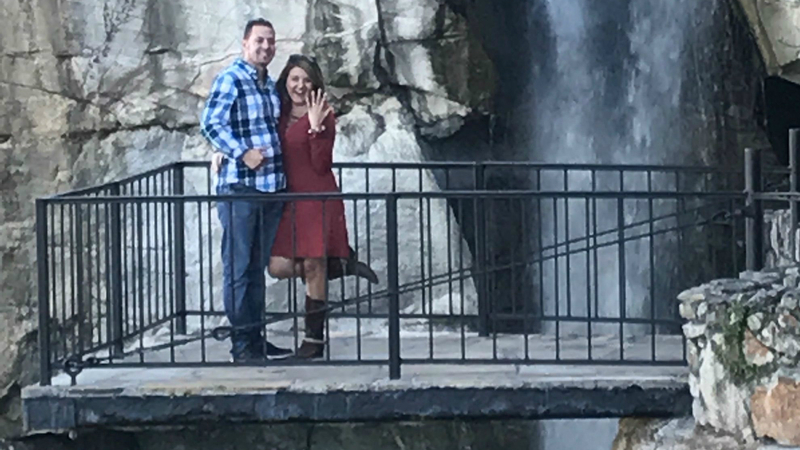 He proposed on top of Lookout Mountain in front of his family. 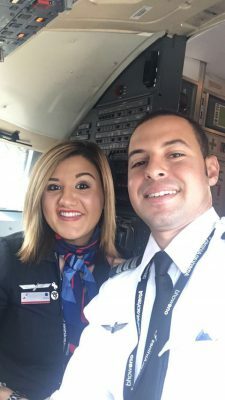 Did you ever think you would marry a pilot/flight attendant? Ciara: Not really, but I liked the idea of dating someone in the industry because they are more understanding of the lifestyle and obviously love to travel as much as I do. So, the word is you eloped in Costa Rica and used your confirmed tickets from American Airlines Group winning the 2017 Air Transport World Best Airline award? Ciara: Yes we did! We flew into San Jose, Costa Rica (SJO) and from there we rented a car and drove to Arenal where we got married. After a few days there, we continued onto Tamarindo. We finished our honeymoon in Tulum, Mexico. 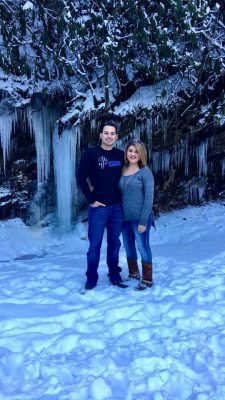 As romantic as a pilot/flight attendant relationship sounds, what are the challenges of having a schedule that demands time away from home? Ciara: Josh is currently working in Pilot Recruitment, so now he has a day job that allows him to be home each night. I try to work my schedule around his to where I’m at least off on weekends. When he’s able, Josh will join me on my overnights. If my work schedule allows, I trade my four-day trips for day trips or two to three day trips, so I have more time at home. Do you two ever get to fly together? Ciara: We’ve only flown together once, last Easter while Josh was a First Officer on the Canadair 700. It was a lot of fun, and we look forward to doing it again. How often do you get to vacation together? What have been your favorite trips? Ciara: We travel a lot! So far we’ve been to six countries, but we can’t wait to add more to that list. It’s fun traveling together because we enjoy doing the same things. We love adventure and experiencing different cultures. I am very big into photography and food. Josh is very much into outdoor activities and excursions. How soon will Josh flow to American Airlines? Do you plan to go with, Ciara? Ciara: Josh is expected to flow through to American in a little less than three years. I personally have no desire to leave Envoy. I love my job here and the flexibility it has to offer. I love the family environment and the friendships I’ve made. I know there will come a time when I leave flying behind when we decide to start a family. « Envoy Captain must choose, flight or flute?